Donal Lenihan believes that Ireland will have regained a small measure of confidence after their Guinness Six Nations victory over Scotland on Saturday, but admits that there are still issues to address on that front for Joe Schmidt. Ireland got their Six Nations campaign back on track with a hard-fought 22-13 win over the Scots at Murrayfield. 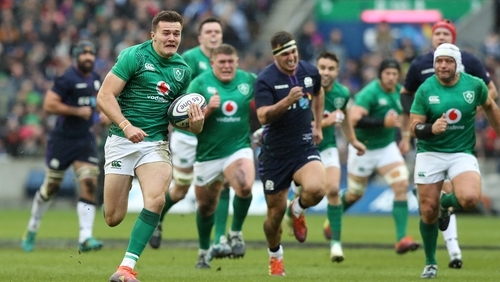 Schmidt’s side had to withstand plenty of pressure from a fired up Scotland and while it was far from a vintage performance, tries from Conor Murray, Jacob Stockdale and Keith Earls proved to be enough. For Lenihan, the ends justified the means in what were some pretty testing conditions. "It was always going to be a bit of banana skin going to Murrayfield," he said on 2FM’s Game On. "Scotland have a good record there of late, hadn’t lost there in the Six Nations since 2016 and it was clear Ireland’s confidence was dented by what happened against England. "So in the overall context [it was] a good win, not a great performance, it was a great game to be honest but I’m not sure if people on television appreciated just how strong the wind was and how difficult conditions were." Lenihan is still struggling to explain Ireland’s sudden dip in form and their apparent lake of confidence, but he claims that part of it is that opponents have worked out how to play against the Irish. "It’s difficult to out your finger on it," he said. "Certainly the confidence levels that had been there right throughout last season, through the tour in Australia in the summer in the summer [haven’t been there]. "The slow start against England, the slow start again the other day, it is difficult to out your finger on it. I think the opposition are probably more tuned into how Ireland play and how you go about stopping them. "Certainly every side we’ve played against so far in the Championship have ratcheted up their line speed, they’re putting less people into the breakdown and there’s just conscious of stopping Ireland developing that forward momentum. "It’s been challenging but I though the response up front was very good. Defensively Ireland were very good, that stand just before half-time with 25 phases of Scottish attack, I think stood the side in good stead. "Scotland looked a little bit defected going into the dressing room and you could see that Ireland were that little bit more energised and I think they were better in the second half."